This is the first of what we hope will be a series of posts showing how to use Python for weather analysis and create graphics for a variety of purposes. 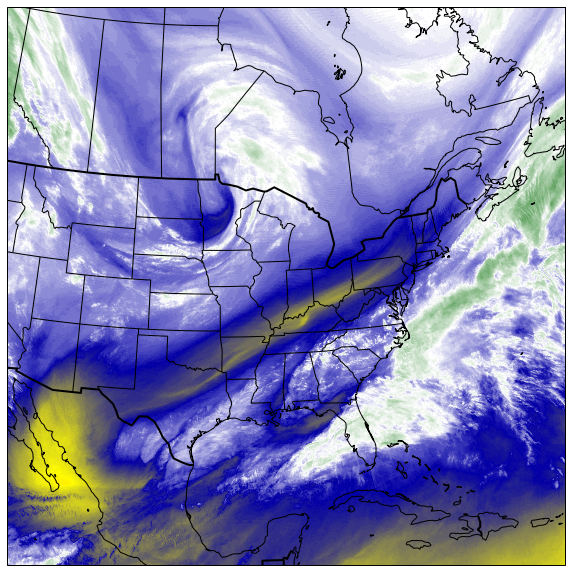 In this two-part post, we demonstrate plotting a water vapor satellite image, specifically using GINI formatted data. GINI is the format currently used for satellite data transmitted across NOAAPORT, and is available on Unidata's demonstration THREDDS server. This first part focuses on accessing the data using Siphon and MetPy; the second part will introduce plotting using CartoPy. Editor's note: Josh Clark was a Unidata Summer Intern in 2015. He graduated from the University of Northern Colorado (UNC) in the spring of 2015 with a B.S. in Meteorology, and is headed to the graduate program at San Jose State's Fire Weather Research Lab starting in the Fall of 2015. It is hard to believe my time here at Unidata has come and gone so quickly! Next week, I imagine it will be back to the “harsh” reality of being a student — sitting on a beach somewhere near Monterey or perhaps fly fishing the Sierras over the next twenty days awaiting the start of my first year of graduate school at San Jose State. What a terrible reality that will be! This experience at Unidata and UCAR has been an incredible opportunity and I am privileged to have been afforded these ten weeks. When I started here, I envisioned an entirely different internship than what previous interns had completed. Rather than developing one particular project, I focused my time on gaining a greater understanding of software engineering as a whole and contributing to existing Unidata projects. I found a comfortable spot working with Unidata Python developers Ryan May and Sean Arms, and within one week I had learned a great deal about unit testing, code health, automated testing, and version control. Later, I would implement these principles in my first Python library, MesoPy. Editor's note: Florita Rodriguez is a 2014 Unidata Summer Intern from Marble Falls, TX. She graduated with a Bachelor of Science in Meteorology from Texas A&M University in May, 2014. I created this hurricane track IPython notebook for all to enjoy. This project was suggested to me by some Python enthusiasts here at Unidata and while I was familiar with IPython and its notebook feature, this was a great opportunity for me to explore the interactive use provided by IPython interactive widgets and how to create an interactive environment in which National Hurricane Center data could be visualized. The IDV group recently received a request from a researcher to have the IDV display CF-compliant netCDF trajectory files. The IDV already has some limited capacity to handle these data. However, this particular request requires the IDV handle multiple trajectories in one CF-compliant file, which is currently not supported by the IDV. We would like to assist this researcher with these data.